The Wait is Over. Hurricane of the Heart is finally available in online stores, Amazon and Kindle. Find more about the book on our Blog Tour starting on Monday July 27. When Kyle agrees to be the best man at his best friend’s destination wedding in Dominica, he has one thing on his mind: partying. But all that changes when a powerful hurricane strikes the island and he finds himself trapped in a village and falling hard and fast for the indigenous beauty queen, Alia Graneau. Alia Graneau has goals that do not include men, least of all an immature, irresponsible American party-animal like Kyle. But the hurricane devastates more than her beautiful island; it wreaks havoc on her heart when she falls under Kyle’s spell and is forced to choose between her ambition, her love for her country and her love for Kyle Robinson. 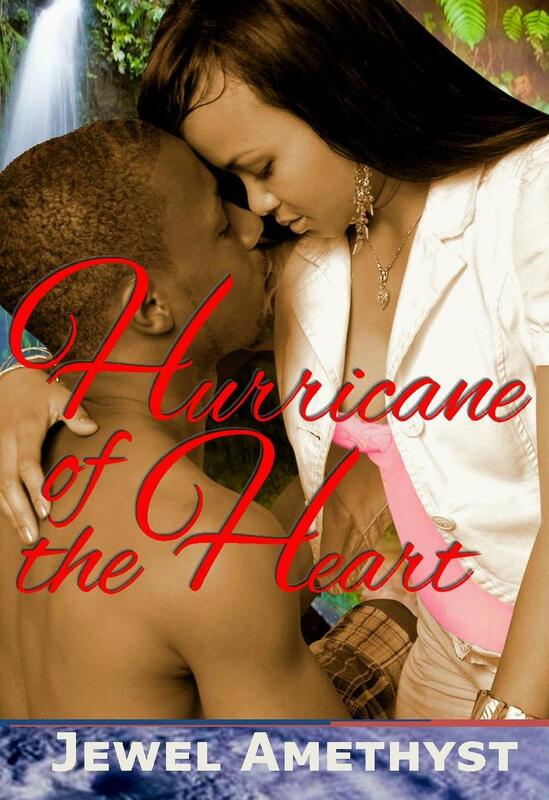 Can their love, born in a hurricane, survive the ravages of real life? Jewel Amethyst is the author of two mass market romance novels, Marriage of Convenience and From SKB with Love one of three stories in the Holiday Brides’ romance anthology. Hurricane of the Heart is her second full-length romance novel.